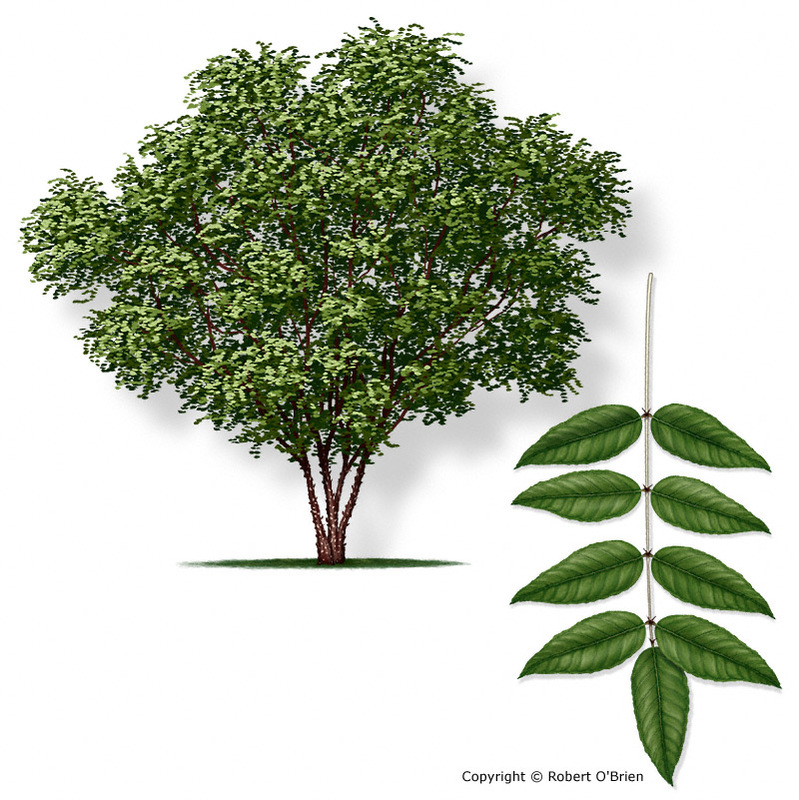 A small tree, seldom over 30 feet in height, with a short trunk usually under 12" in diameter. Easily identified at a distance by the large, knobby warts on the trunk and branches. East and Central Texas to the valley of the Colorado River. It seems to prefer a well-drained, light, sandy soil, and is often found growing on bluffs near rivers, at the edge of woodlands, or along fencerows. Alternate, once-compound, 5" to 8" long, with 7 to 17 leaflets, each 1" to 3" long, ovate or lanceolate, toothed, with several sharp prickles along the rachis. The small, pale green flowers are borne in loose, wide­branched terminal clusters, 4" to 5" long, blooming in early spring after the leaves emerge. Fruits ripen in early summer, producing a loose cluster of dark brown, one-seeded capsules. Once ripe, the valves open to expose the small seeds, which are quickly eaten by birds. Light gray, thin, and covered by many sizes of knobby prickles, shaped somewhat like crocodile teeth, as large as 2" in diameter and 1" tall. Soft, light brown, with no special value. Texas Hercules'-club (Z. hirsutum) has 5 smaller leaflets and occurs in Central Texas; lime pricklyash (Z. fagara) has tiny leaves with winged rachis and occurs more in South Texas and the coast. The twigs and inner bark can be chewed to produce numbness or a tingly feeling in the mouth, which was used as a home remedy to deaden toothache pain, giving the common names, "toothache-tree" or "tickle-tongue."